I’m Now President of the O.C. 59 Club Section – Stoked. I have lived this lifestyle for many decades, cant tell you why I love this and the passion for Motorcycles and old vintage things but that’s just me, but- there are many like minded people around the globe and we all share something in common. I have been honored to have the title of the president of the 59 Club in the O.C. and am looking forward to meeting you on some of the rides we shall be organizing, as I hope to do this for fun, relaxation and sometimes for a charity too. We have a certain camaraderie and I wanted to just drop some lines and information about this historic club that started back home and now flourishes around the world. Make a cuppa, put your feet up and try and absorb some of this information below if you are interested in being part of this great club. Peace and Grease as always. First some History on this Ton Up Club. 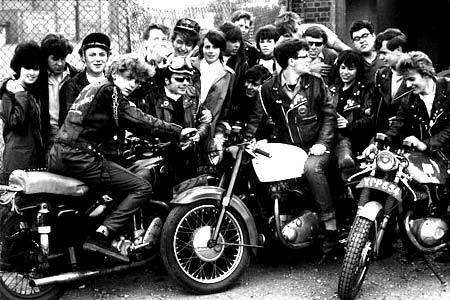 The 59 Club, or Fifty Nine Club, was formed in London, England by Reverend Fathers John Oates, Bill Shergold and Graham Hullet in 1959 as a church-sponsored youth organization to help underprivileged youth in the church’s parish. 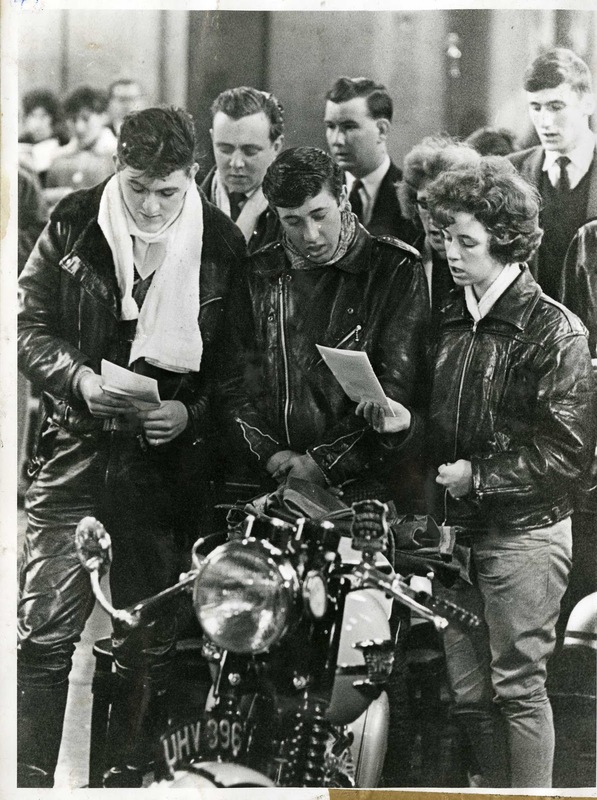 In 1960, sensing that the young rebellious bikers of North London that raced along the North Circular Road might be in need of spiritual guidance, Reverend Bill Shergold, an avid biker himself, rode up to the Ace Café to see if these “Ton-Up boys,” as they were called, would be interested in Sunday mass services where they could have their bikes blessed. 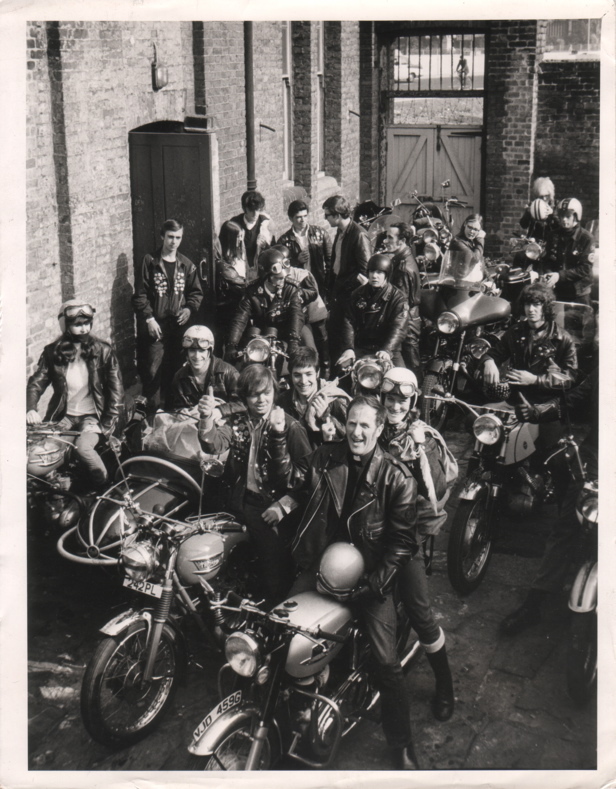 Surprisingly it turned out to be hugely successful, and thus the relationship between Londons bikers and the 59 Club began. By 1962 the club had transformed into a very popular hangout where the wild biker hooligans of the time could socialize, tune-up their bikes, play billiards and basically stay out of trouble. It also became a clubhouse where you could dance and listen to 1950s Rock’n’Roll and Rockabilly music, which was favored by the Rockers and their predecessors the Ton-Up boys. The club was also the first place to premiere the 1950s Marlon Brando film The Wild One, which was banned in UK cinemas by the BBC. 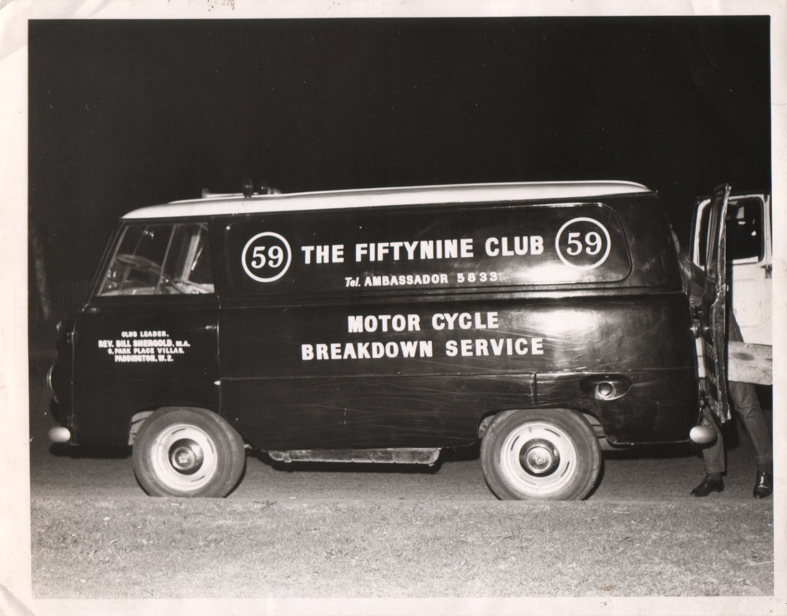 Throughout the 1960s the Fifty Nine Club sponsored numerous motorcycle rallies in Scotland, Wales, Germany, and the famous T.T. Races on the Isle of Man; and it became a beacon in the community for social activism when it became a registered charity in 1965. Within a short period of time the motorcycle section of the youth club became so large it overtook the entire club and eventually transformed into the 30,000 member strong, worldwide motorcycle club it is today. The clubs success, according to Father Bill Shergold, was based on its entire lack of rules or formal structure and its association during the 1980s with the Rocker Reunion Movemement created by Len Paterson. 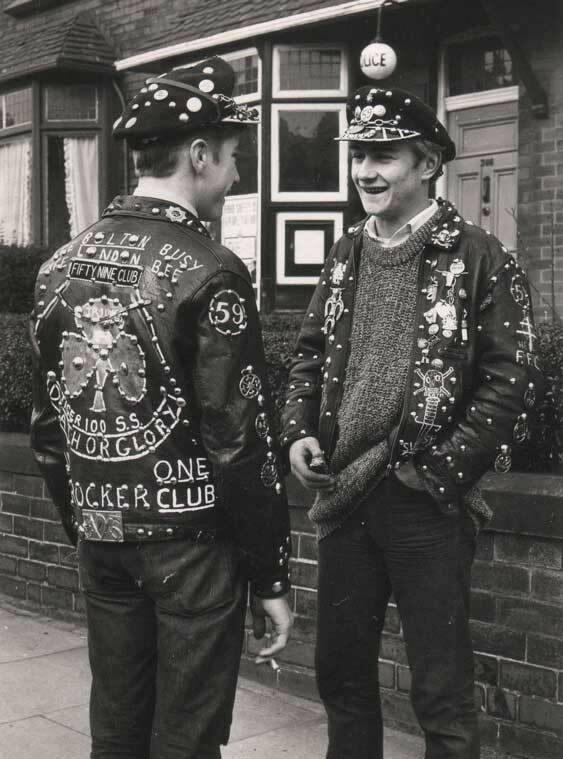 Also pivotal to the clubs legacy was the creation of a Classic Section, a sub-group of members dedicated to upholding the 1960s Rockers subculture (the music, the fashion style, and British motorcycles). The 59 Club is now based in Plaistow, London and meets twice weekly. It remains a registered charity as established in 1965, and has evolved into a place where families and bikers are welcome. Today the club is led by Father Scott Anderson, a fellow motorcycle rider and Rocker, and is still favored by those who are passionate about classic or vintage British, European and Café Racer style motorbikes. Current members continue the proud 50 years-long traditions and original club philosophy of having: no rules, no ranks, no politics, and no church agenda. Even though we are a registered charity we are not a ‘Christian motorcycle club’ or a religious organization, but the club is open to male and female bikers alike. Also important is that the club has never been a 1% or outlaw biker club, but do we respect all motorcycle riders. The club exists today as a historical celebration of the original 1950s and 60s British biker subculture, which was centered on 1950s Rock’n’Roll and Rockabilly music, British motorbikes and Café Racers. The club also maintains strong ties to the Ace Café and the annual Rocker Reunions outside of London each year. Over the last five decades the club has become an icon in the international Rockabilly music community and Café Racer motorcycle scene. 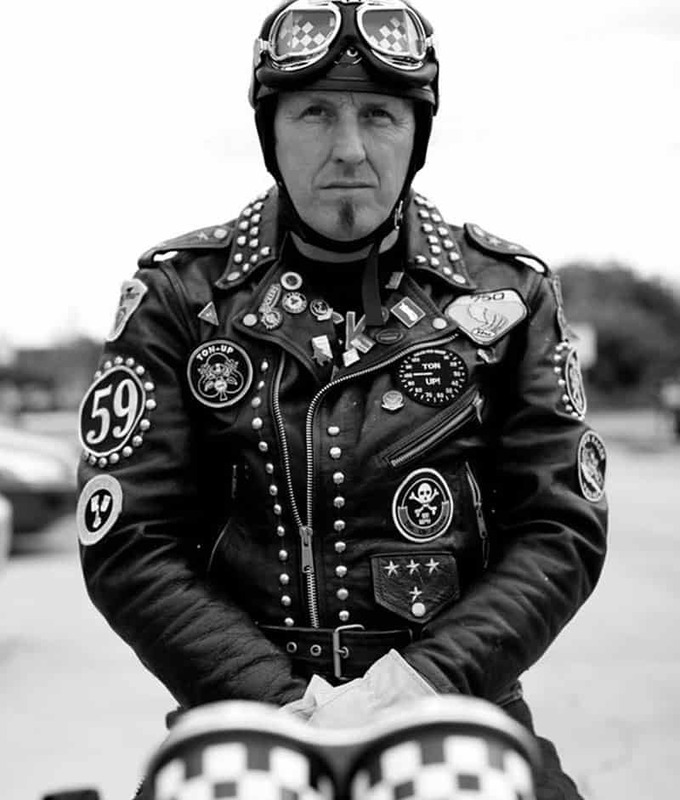 The 59 Club is still a motorcycle club for individuals who are passionate about riding bikes, gathering at late-night pubs and cafes, and attending bike related events, like the annual ride to Brighton from the Ace Café in North London. Our 50 year relationship with British motorcycles, Café Racers, the Ace Cafe and Rock’n’Roll music has been and always will be our pride and passion. The Fifty Nine Club has officially recognized sections in Australia, Belgium, Chicago, France, Germany, Italy, California, Spain, Switzerland, and Texas. Only card-carrying members are allowed to wear the 59 Club patch. These members have paid their club dues and have ID cards registered in London. We wear our patches with pride knowing that we represent a motorcycle club with a vibrant British motorcycling history and a worldwide following. We equally cherish the clubs association with the modern Café Racer motorcycle scene. So why a California branch of the 59 Club of England? Well after being a member of the 59 Club for many years, I along with friends from Los Angeles and San Diego who are also members noticed a disparity that we felt needed to be addressed, there was no unified 59 Club representation in Southern California for members to belong to. So began the yearlong email inquiries to London about creating a new section, and having their authorization and blessing to do so. After many, many months of communication we were given the green light to move forward with this new American section, we first created a Facebook page for current members and supporters with plans for an official website to come later. Secondly we sought approval from the Ton-Up/Rockers community in England who needed to know we were doing this with respect and the strictest adherance to British 59 Club customs and traditions. This was not going to be a ripoff of the name or a mockery of 50 years of British motorcycle culture, we wanted to do it right; we eventually got a nod of approval from a large number of Rockers new and old from England. And here we are now almost 3 years later with new members in Los Angeles, Bakersfield, Orange County, and San Diego; a gathering site for Southern California members who were already in the club, and a new website to respectfully promote the original 1950s/1960s British motorcycle subculture here in So Cal. Having spent time in England and Europe, and being a biker for the better half of my adult life, as well as being a Rocker for over a decade, I would like to dedicate this website to my brother and sister Rockers in England, Australia, Europe and the very, very few of us that exist here in the States. I’m proud to be a Rocker and a member of the 59 Club of England. I want to thank some important people in the Rocker/59 Club community for all their support over the last year and a half; Larry Fletcher of 59 Club – Chicago, Shadow from 59 Club – Australian, and friends from England Heather and her husband Max from the former original 59 Club – Italian Section. I also want to thank the Council of Management in London, specifically Sandra Hall, for their blessings and support of this new American section. Lastly, I want to dedicate this new section to the growing Cafe Racer scene here in the U.S. and to the hundreds of American bikers in Southern California that choose to ride vintage or classic British motorcycles. So ride with the wind at your back and the warm sun on your face, we’ll be riding up the North Circular to the Ace Cafe, in spirit at least. Below, me and mark Wilsmore from the Ace and good friend and an ambassador of the Ton up lifestyle that I truly live and love. The California arm of the 59 Club carries on the original club ideology and passion for vintage motorcycles like BSA, Norton, Triumph, AJS, Matchless, Royal Enfield, Ducati, Moto Guzzi, BMW, and Café Racers from Honda, Suzuki, Yamaha and Kawasaki. Our members come from all walks of life; blue-collar and white-collar, male and female. Most members are in their 30s or 40s who’ve been riding for a long time, some are educated professionals, and some have families, most of us ride on the weekends, some of us ride every day. Overall the club has a very diverse mix of people and backgrounds, but we all have one thing in common, riding vintage or classic British, European or Japanese bikes and café racers. As an officially recognized section with card-carrying members all over Southern California we keep true to club traditions; therefore we have no club officers, no politics, very few rules, and we have zero tolerance for personal drama, racist or sexist attitudes, drug use or criminal activity. You don’t have to be a Greaser or love Rockabilly to join our section, but you do have to own, ride and maintain a bike that reflects our club philosophy, you have to understand our club history, and hopefully feel a kinship with what we represent. We also support other clubs with similar passions. Overall we want to keep our club and our sections focused on meeting up at out-of-the-way locales, fun rides, camaraderie and sharing a few rounds of beers with your mates. We ride as a group, and often with other Southern California-based clubs. 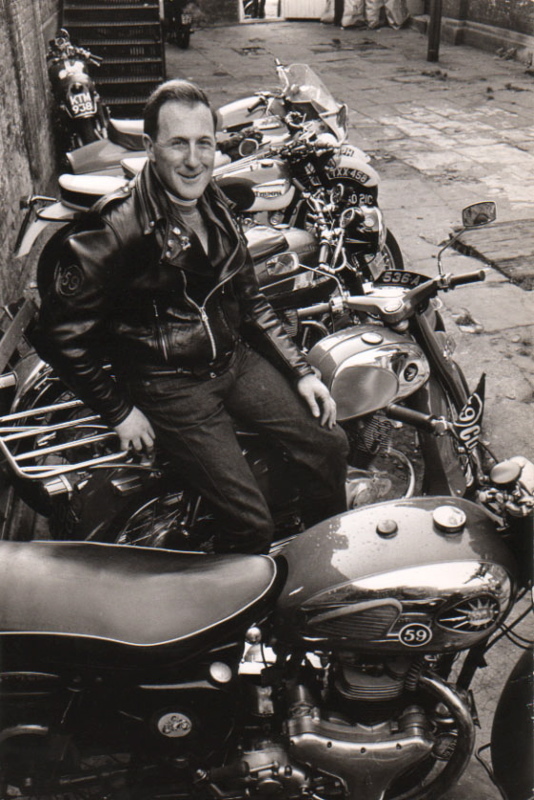 We attend music & bike events, weekenders, and basically enjoy the biker lifestyle as the original Ton-Up boys and Rockers did in 1950s and 1960s Great Britain. And where ‘cracking the ton’ was a customary rite of passage in England, it is too a rite of initiation for the California arm of the legendary 59 Club, among other traditions such as jukebox ‘record racing’ between pubs and diners. This entry was posted in Uncategorized and tagged 59 club, ace cafe, Bell, bill shergould, BSA, cafe racer, davida, esso, goldy, leather jacket, leathers, manx, matchless, milk bar, motorcycle boots, north circular road, norton, rock n roll, rocker, rocket, skid lid, studs, thunderbird, ton up, triumph, winkie pickers.